I have a little message for you Mister Weekend. Think you're all big and strong with your extra day huh? Oooh check me out, bit longer than usual, everyone loves me yeah. Well buddy how do you fancy a little..
CRANE MANOEUVRE to the SHNOZ ? 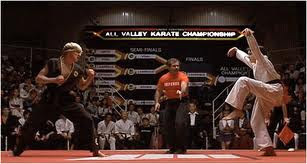 I'm taking you to the cleaners and walking away with the All Valley Karate Championship.